I tried out something new so I've made a process video for you. 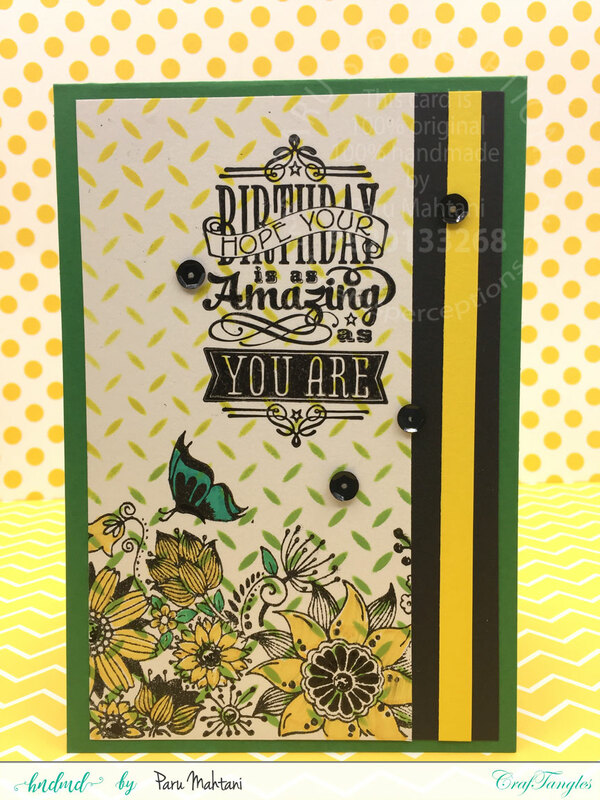 For the first card, I've used the Craftangles 'Treads' stencil and Tim Holtz 'mustard seed', 'crushed olive' and 'mowed lawn' distress inks to create the background. One done, I stamped over it using the Craftangles 'Beautiful Bloom' border stamp. I then coloured in the stamp using faber castell sketch pens. I then added the bold sentiment from Hot of the Press, trimmed the panel down to size, added some additional cardstock to the side for interest and adhered the panel to a cardbase made with Craftangles 'Emerald green' cardstock. I finished the card with some black sequins from Craftangles. 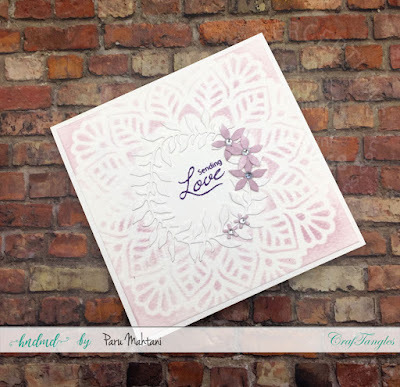 Tim Holtz 'milled lavender' distress ink to create a soft background. I die cut the wreath and the flowers (Impression Obsession), coloured the flowers using the same ink and adhered them to the card panel. in a darker ink of the same tone. A sweet and serene card that can be used for any occassion. For the third card, I wanted to create an underwater scene...something I had seen many times on Instagram. I looked up some videos on youtube and came up with this. I just love how this card turned out...I will surely be trying out this technique again. Do check out the process video below. It isn't perfect, but, it shows you how the card is made. I hope you enjoyed the video. If you have any questions, please feel free to leave me a comment. 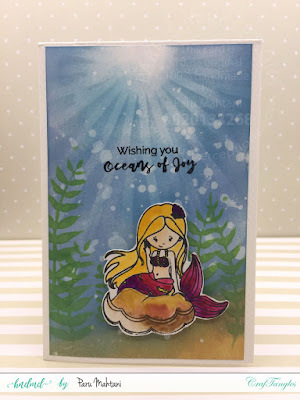 Craftangles 'mermaid kisses' stamp set. I hope you have enjoyed this post and these cards as much as I have enjoyed making them. Thanks. Mine too. I will check the video. Try now..the video is playing.